Just before you reach Ballachulish went travelling south from Fort William, you will pass the Corran ferry which takes passengers and vehicles to Ardgour and is a useful short cut to getting into Morvern and Ardnamurchan. The ferry runs across the Corran Narrows about every half hour from around 7am to 9pm (8pm in winter). Photo Copyright © 1994 Corel, The Internet Guide to Scotland and its licensors.All rights reserved. Not to be downloaded or reproduced. 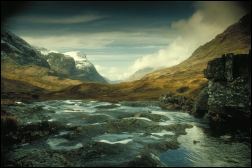 The Discover Glencoe web site is a complete guide to Glencoe and surrounding area, with details on accommodation, where to eat and shop, as well as outdoor activities, events, maps, history, special offers, local blogs, etc. 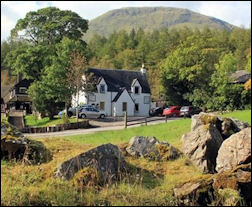 The Glencoe & North Lorn Folk Museum is situated in two 18th century thatched croft houses in Glencoe village's main street (next to the village shop and post office). Open Easter - October from 10.30am to 4.30pm Monday to Saturday (tel: 01855 811664). Admission charge for adults. B&B prices from £49 per person. 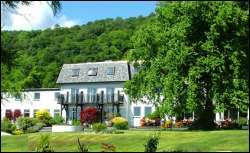 B&B prices from £47.50 per person. 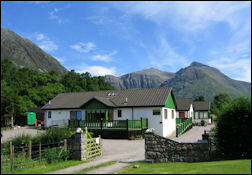 Blackwater Hostel & Riverside Campsite, Lab Road, Kinlochleven. Scottish Tourist Board 3 Star Hostel. 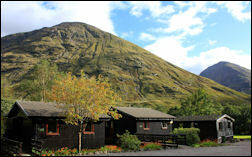 Bunkhouse accommodation with 40 beds (2, 3 and 4 bedded rooms and an 8 bedded room). 30 camping pitches with own toilet block, showers, etc. Tel: 01855 831253 or 831402 / Fax: 01631 740549.